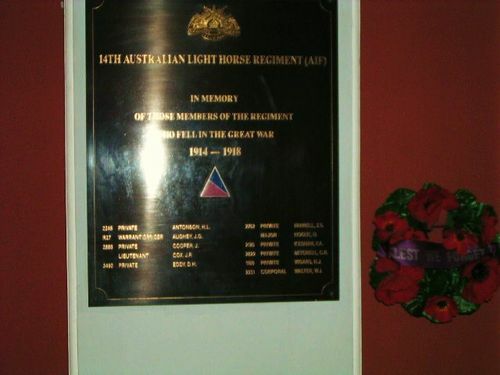 The plaque commemorates the members of the 14th Light Horse Regiment who died in service or were killed in action in World War One. The 14th Light Horse Regiment was formed in Palestine in June 1918 from members of the Australian companies of the Imperial Camel Corps (ICC). The ICC had been disbanded because camel-mounted troops, a valuable addition to the British forces in the deserts of Egypt and the Sinai, were not suitable for the conditions being encountered in Palestine.